"July 15 is the day of democracy" Prime Minister Yıldırım while pointing out that the Nation have given the best answer to the terrorist gang by waving their flags of the star and crescent stated the following: "July 15 will be observed as day of democracy. I remember with gratitude mercy and blessing all those security forces, our police and our civilians who lost their lives in this coup attempt. I share the pain of the relatives of the lost ones and I would like wish my condolences. I pray to God to heal our wounded." "Thank goodness we have driven away a big disaster with the help of our nation. Thankfully, this attempt was not an armed uprising with the command control hierarchy of the Turkish forces but was an uprising by the parallel terrorist organization in the armed forces. I, hereby, would like to congratulate our valuable commanders and our officers who love their country, their nation and their flag and did not pay heed to this cowardly attempt." "I would like to especially congratulate all our special forces, our police officers and our security personnel who have driven away this attempt by fighting heroically with their lives. On behalf of our nation I would like to offer my gratitude and gratefulness. This event we experienced has revealed one thing. The whole world saw once again how important democracy and the country's national will is for our independence and how vast an experience the Turkish nation has on democracy. "2839 officers of various ranks has been taken into military custody"
Prime Minister Yıldırım gave the following information: "This uprising was suppressed, but we have a total of one hundred sixty-one martyrs and one thousand four hundred and forty wounded so far. We have taken into custody so far two thousand eight hundred and thirty-nine officers of various ranks who were involved in this vile attempt and these incidents. Senior ranked officers have also been involved." "The return to normal life by our citizens today is an indication of their virtue. Those who opened fire at the citizens of this country with guns, money, tanks, bombs, planes and helicopters of this state are more despicable than the PKK terrorist organization." “Since the beginning of the incident, the patriotism and prudence demonstrated by our Chief Commander, Mr. President has enabled our Government, patriotic commanders and our nation to unite and overcome this calamity. I praise the God for blessing our nation with such an unprecedented victory against this non-proportional force.” Yıldırım said and continued: "Our media institutions as well as social media have also demonstrated such a good example of patriotism and prudence. Since the very beginning of the incident, they have adopted a clear stance against this gang, stood by our country and nation and informed our public in the most accurate way. Moreover, particularly the leaders of political parties as well as non-governmental organizations have left their differences of opinion aside to pour out to squares and raise our flag on top of the tanks." "This is the end of the first stage. In the ensuing period, our citizens will continue to live their lives as usual while we give the necessary response to those who have attempted to discredit our country and nation. We will proceed on our way with the same determination." "Situation is Fully Under Control"
"Situation is fully under control. Our commanders are in charge." "As is known, capital punishment has been abolished in the Turkish legal system. Today, our parliament will convene and we will discuss with other parties the additional measures or legal arrangements that should be put in place to prevent crazy attempts of this kind in the future." "I do not Think any Country Would Stand by This Leader of a Terrorist Organization"
"I do not think any country would support this person (Fethullah Gülen), the leader of a terrorist organization. Countries standing by this person will not be a friend of Turkey." 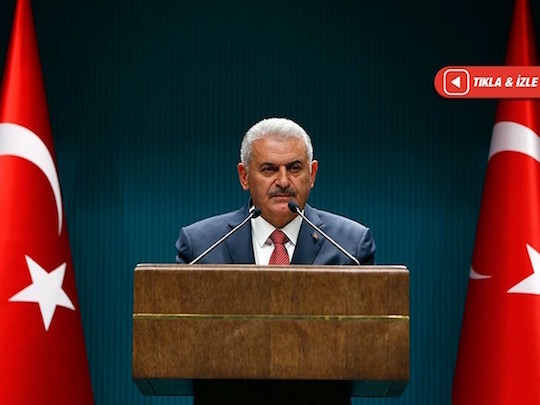 "They will Pay a Heavy Price"
Prime Minister Yıldırım concluded his remarks with the following words: "All groups that threaten the unity of our country, whether it is the parallel terrorist organization and separatist terrorists, will pay a heavy price. We will do what is necessary without any delay."